A Day in the beautiful island of Santa Maria. The next course of our schooling. The biggest lesson life is teaching us here is to become experts in doing absolutely nothing. Island living is simple, especially in the summer months. You pretty much wake up, eat, go to the beach, eat more… maybe go to one of the three cafes in the town and have a drink, socialize, or watch a movie, go to sleep, repeat. Sometimes a hike, a boat ride, a trip to the market, or spearfishing/snorkeling gets thrown in, but there really is not much to your average day. A stereotypical type A personality might have culture shock coming to spend a day in Santa Maria island, and find it hard to embrace doing pretty much nothing. Often, we are unaware just how much we judge ourselves by how much or how little we produce, and how successful we perceive ourselves to be, and so for us, this sort of simplicity and relaxation falls nothing short of invigorating and energizing! It is helping us focus on what truly matters in life- family, relationships, connection, appreciation, and gratitude. Due to the amount of free time we have, we are also learning a lot about ourselves, especially in learning the importance of rest and how to be at peace with ourselves and each other. Developing and maintaining a still and quiet mind is an entire lesson in and of itself. 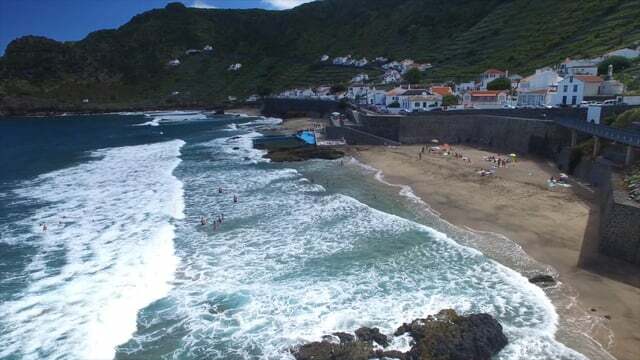 The beautiful island of Santa Maria is one of the nine Azorean islands, located approximately 800 miles off the coast of Portugal, although it actually sits closer to the northwest part of Africa since it is the southernmost of the nine islands. Being the third smallest island in the Azores, it inhabits approximately 4,500-5,000 people annually, and is 10 miles long and 6 miles wide. John & Ines Sousa (Amelia’s grandparents) were both born on the island and after about 11-12 years of processing his immigration application, John was notified that they were able to immigrate to the United States, where they could be granted citizenship once the necessary paperwork was filed. He, along with his wife Ines, and their infant son, Dennis, immediately left the island and set off to California to start their new lives. It would be over a decade before they were able to visit again, but eventually returning to this island became a regular tradition the family looked forward to, and one that we are also blessed to be celebrating. There truly are no words that come close to describing the breathtaking beauty of Santa Maria! The beauty and the serenity of this island captivates and holds you, causing you to feel at peace with God. The various terrains throughout the island alone are utterly breathtaking; from desert sand that looks like it belongs on another planet, to prairie’s so vast, they resemble rolling savannahs, to rainforests so lush you can almost taste the rain, to sandy beaches with water so blue and clear you can see all the sea life that swim in its depths, to lava rock cliffs, waterfalls, and jaw dropping hiking trails. Except for temperatures that linger between 70-75 most of the time, the weather is unpredictable, changing moment by moment, which makes it all the more beautiful. From spear fishing to eating lavish meals, to spending quality time growing in our relationship, to simply practicing (and we think mastering) the art of doing nothing; we have learned so much more about ourselves and about each other these past five and a half weeks than we ever could have imagined. We have grown so much spiritually since being here. Pico Iyer, the British born essayist/novelist says, “We don’t travel so much to move about, but to be moved; some moods, some intimations or places inside yourself that you don’t often see in the daily grind of life.” Slowing down to read, becoming silent witnesses to the beauty all around us, pausing long enough to deeply reflect, meditate/pray, along with our discussions with each other, with family, friends and the people we are meeting and conversing with here has been life-giving. Combined, we have read 4 books since being here. Each book now represents a level of growth, and each seems to have come into our lives at the exact time we needed it. Have you ever had the feeling that life handed you a book? That feeling is the truth… and we believe God has chosen these books for us to read, whether we have chosen them through our own intuition, or life has given them to us through word of mouth, or by another person. Tuesday’s with Morrie: by Mitch Albom. Letting go of control of our trip was the first step, and honestly, one we still struggle with it. We believe that not only on vacations, but also in general, we work very hard to control every aspect of life, attempting to make every change and every situation comfortable in our own minds. As we shared in a previous post, this often stems from fear, anxiety, a lack of trust, or whatever it may be. It’s that little voice in your head that is always clamoring at every decision and every move you make. The Surrender Experiment, a book we’ve both read and have learned from a significant amount, describes how a young student studying economics, drops out of his PhD program to become a yogi and surrender to the flow of life and trust that life’s perfection would take him down the path(s) that was destined. The book refers to the spiritual power that guides your life’s path as “life” or the “universe”. We noticed that if the author had replaced those words with God, he would sound preachy, which could make it harder for people to even focus on the content of the book and what the message is. We debated using the word “life” or “universe” in this post instead of God, but felt it would not be authentic for us to do so. So, as you’re reading the rest of this, keep in mind that “God”, “life”, and “universe” can all be used synonymously, because God encompasses all things. The Surrender Experiment posed this question: “Is it possible that life has more to give us than we could ever take for ourselves?” What we are learning is that receiving all that God gives and all that life has to offer will require us to surrender and give up control. This is very foreign in societies like our own and has been very challenging to us as well. Once we decided that God would take control of our trip, we were confronted with the idea that our lives should follow this trajectory, with God in charge, and us as co-creators, along for the ride! In making that decision, God has revealed himself in many ways; ways that only now, seem obvious and apparent. We believe that God is ALWAYS speaking and ALWAYS revealing… Perhaps it’s in this deeper awakening, that our eyes are simply being opened to what he has been trying to tell us all along. We have vowed to each other to continue to practice letting go of control and letting God be the captain of our lives, and so, from this point on, we are committed to having no real plan, other than completely surrendering to life’s perfection. It has been very hard letting go of all aspects of control, especially when thinking of all the things you want to see and do in an adventure like this. However, the deep sense of security in God’s plan diminishes this desire to control, and actually creates more inner peace than we could have ever imagined. Learning to listen to God’s plan over our own is what we are endeavoring to accomplish, both physically and spiritually. Many other aspects of our spirituality are radically changing, and evolving, and so much of life is learned in the conversations we have with one another, aren’t they? We would love to hear from you, and for you to join in the conversation. We have opened up the comments section for any and all comments/ questions. In our time here, more than A Day in Santa Maria, we have met people from all over the world, and specifically, people from Europe who have invited us to stay with them a while, who have offered to show us the culture of their country, and see from their perspective. We have been so blessed by others. If anyone has any family, friends, or loved ones in and around Europe & Asia, we would love to get their contact info, possibly meet them, make some new connections, and grow some new friendships. While we have no specific plans, the possibilities for starting new relationships abound!